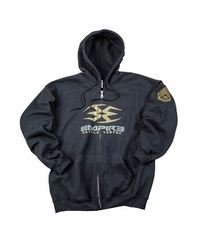 Stay warm on and off the field in an Empire Battle Tested Ops Zip Hoodie Sweatshirt! You're in the BT Army now! The Empire Battle Tested Ops Zip Hoodie Sweatshirt is a generously sized zip hoodie made of heavy thick cotton for luxurious warmth. Front print graphics and sergeant stripes on the arm let you rep your favorite scenario/ woodsball company!